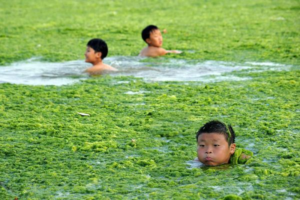 Eutrophication (excess levels of nutrients in water due to fertiliser use or other human activities) means that surface waters are often affected by algal blooms. These blooms are often undesirable, not least due to the toxic substances that are released, affecting people and the environment. Dead animals, the disruption of food webs, and problems for bathers such as skin disorders, nausea and headaches are just a few examples of these effects. Toxic algae are also found in coastal waters. They accumulate in shellfish and can make people very ill indeed. The toxic species found in the Netherlands may cause vomiting, stomach cramps and diarrhoea. In countries such as Australia and China, algal blooms can render water in lakes and reservoirs unusable for drinking water or for fishing.Water management authorities can use innovative approaches to monitoring such as spectral analysis or participative monitoring (citizen science), diagnose correctly, set up forecasting systems and provide the public with adequate information. Fishermen, fish farms and leisure users can benefit. We help to develop these innovative methods and we build the forecasting systems. We also investigate the causes of eutrophication and provide advice about tackling the symptoms.